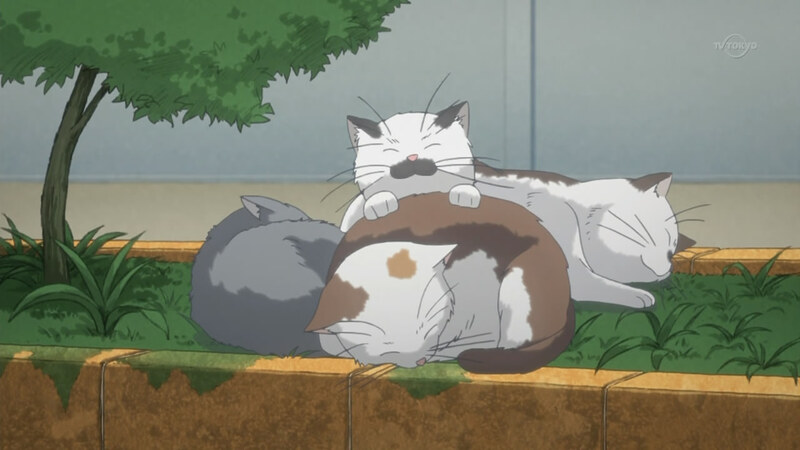 Even before this anime came out, I was very interested in it being one of my few blogging picks for the season. 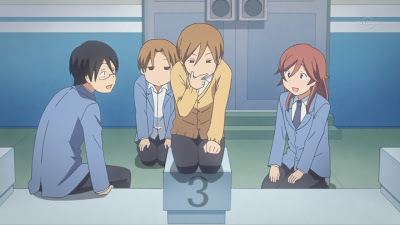 After tons of anime that feature either an all-girl cast or one with mostly girls, I was very intrigued to see an all-boy cast that wasn't shounen. After watching this first episode, I'm ridiculously pleased and excited. 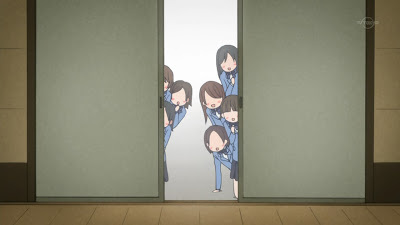 The first episode was more about setting up the future plot than anything else, focusing on four childhood friends as they entered into their second year of high school. 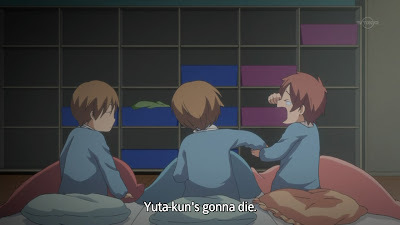 The friends fit into very clear archetypes: the stoic glasses-wearing Kaname, the emotional "baby" Shun, and the mischievous twins Yuta and Yuki (with the former being older). This episode was focused on Kaname attempting to get Yuki to join a club. Why is Shun's hair so short here?! There was no mention of the blond fifth person in their group, the one that's supposed to be crucial to the story, so I assume that he's a transfer student coming in for the next episode. 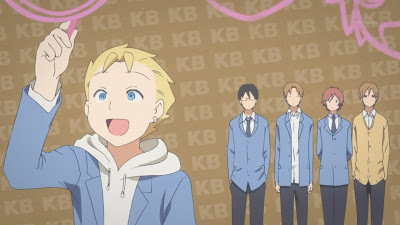 After the introductions happened with this episode, there was more of the slow-paced feel as Yuki and Yuta caught Kaname spending 100yen on oolong tea, commenting that he acted like a rich kid. Kaname, meanwhile, was irritated that they were eating lunch on the rooftop despite it being so windy, while the others wondered why he had accepted the invitation if he didn't like being on the roof. The situation didn't end there, which also allowed the viewer to understand more about the group. 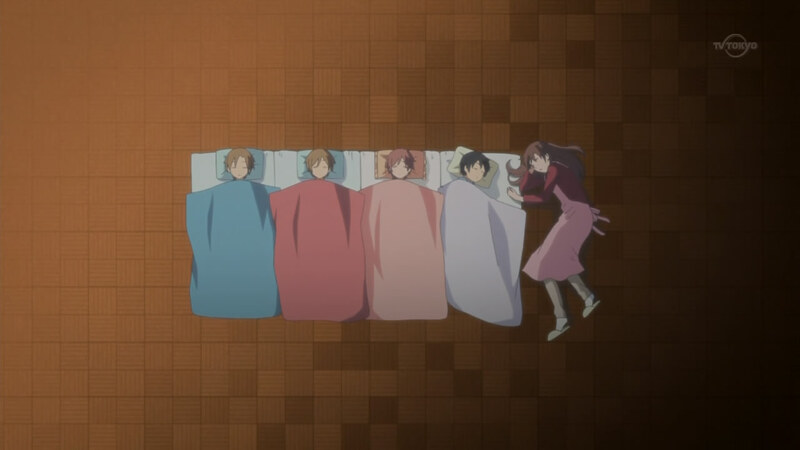 With the sleeping arrangement as Shun, Yuta, Yuki and Kaname, the twins suddenly realized that lying in the middle together made it seem as though they were one person, and thus slated for a shorter life span. Separating them, with one at each end, meant that they couldn't sleep (with Yuta commenting that being a twin was difficult). The final arrangement was Yuta, Yuki, Shun, and Kaname, which worked out well until Kaori-sensei (whom Kaname especially liked) showed up. Seeing as how they weren't asleep, she offered to sing them a lullaby and ended up falling asleep next to Kaname...making Shun's position the one in the middle. Girls are so quick to find the cool ones. Kaname wanting Yuki to join a club came almost out of nowhere, as his excuse was that he wanted Yuki to understand what was lacking in his high school experience. The first option was the basketball club, where they forced Yuki to participate in a practice match. It was quite obvious that Yuki didn't care, even avoiding the ball when it was passed specifically at him. The comment that he definitely needed to join the basketball club if he wasn't very good at the sport, since they played it so often in PE, made him actually care, and he showed off by perfectly stealing the ball, dribbling to the basket, and getting it in without any issues. Yuta revealed that Yuki was actually quite athletic, and even more amazing when he tried. The attempts continued, with the next one being the Judo Club. 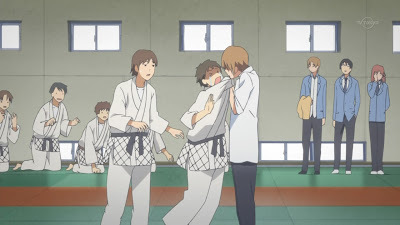 Yuki managed to scare and scar his opponent by reacting menacingly when the guy grabbed Yuki's collar (with Yuki's excuse being that the opponent had just suddenly grabbed his shirt, as if he wanted to start something). The foray into archery didn't go well, with Yuki misunderstanding that the point was to shoot the target, as he asked who he was aiming at. It was pretty clear that Yuki's some kind of genius, if only he cared. I know that personality is very cliche, but I can't help it. I loved every minute of it. After the group took a break in the classroom and had a talk with the teacher, who suggested that they try non-athletic clubs since a person wouldn't always want to do only what they were good at, they headed out to try some other clubs. I was a little hopeful when they headed for the Tea Club; I had assumed that perhaps the blond guy would be there. 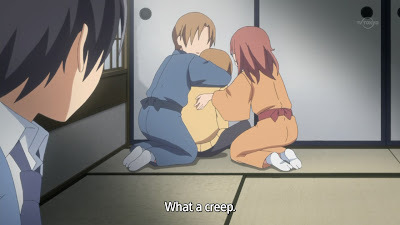 (At this point in the episode, I didn't know that he wouldn't be showing up.) Kaname sipped the tea and wiped the cup expertly, making me wonder if he really is a rich boy (that, or he might just be part of the club). It still didn't stir anything in Yuki, who lounged around reading manga as Kaname tried to come up with a new idea. 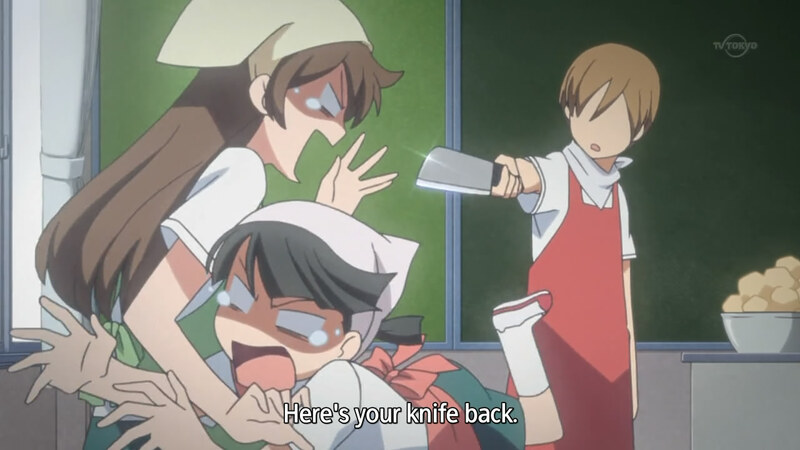 The twins are good at keeping Kaname in check. Of course, the fact that Yuki was reading manga in his spare time resulted in the revelation that all he was interested was manga and anime, and so the group headed over to the Manga Society clubroom. Kaname, incredibly irritated that all his efforts could have been avoided if only Yuki had been forthcoming since the beginning, huffed off in annoyance thereafter. 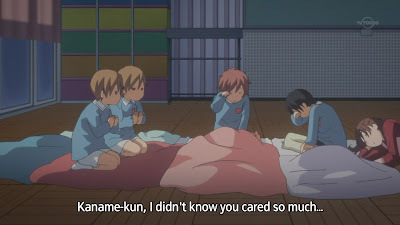 Shun, being the super nice guy that he is, explained the rest of the story seen earlier in the episode, that Kaname had actually talked it over with Shun to switch places, despite getting to sleep next to his beloved Kaori-sensei if he didn't do anything. Yuki and Yuta revealed that the only reason Kaname had done that was due to the evil looks that the twins had given him. This is what makes Shun the baby of the group; everyone looks out for him. Those are some really big cats. It turned out that the Manga Society was pretty much akin to the Going Home Club, which meant that nothing at all had changed. Kaname, hearing this the next day, was exceptionally dejected. This really set the stage for the blond guy to come in and change their never-changing and boring life. (Personally, I don't see what's boring about their lives now, considering all the work they did in this episode, but okay.) 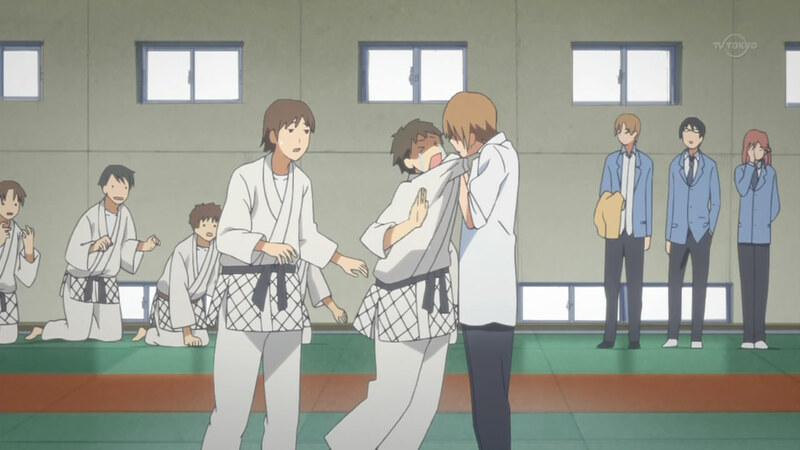 I'm very excited for this anime; not only does it portray an all-male lead cast in a shoujo slice-of-life setting, but it also has little intricacies that excites me. I love how the cast members are all represented as cats, with scenes cutting to shots of cats roaming around and doing something symbolic (such as a cat playing with some catnip while Yuki was trying to get his manga back from Kaname). Evil people would push him off into the water. 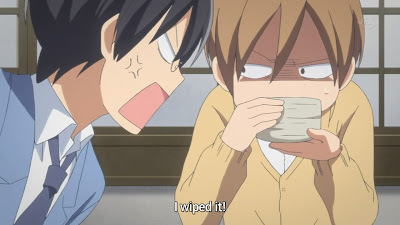 It's pretty clear just how much I like this anime when I was able to sit through two iterations of the first episode, once from Yagami and the second time from Sage. I wanted to know which group to follow and since both of them are essentially rips from Crunchyroll with some clean-up work (typesetting, translation, etc), it's pretty hard to make the call. I hear that Yagami took the OP/ED karaoke from Sage; how true this is, I don't know. 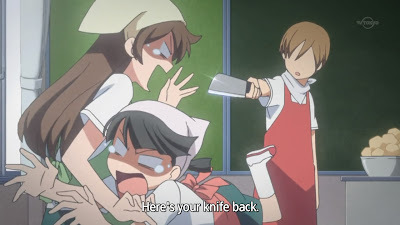 Visually, it looks pretty identical, and I know that Crunchyroll doesn't do OP/ED to begin with. As far as translations go, there are some differences; without seeing the original, I don't know which group changed it. (Like at 2:58, where Yagami had [Who cares what I buy?] and Sage had [Does it really matter? ], where the Japanese said [betsu ni ii ja nai ka? nani ga totte].) Since I happen to like Yagami's typesetting better (what a shallow reason...), I'll be going with them for the season. Envy, who's also watching the series, will be getting Sage, so perhaps we'll be able to come out with a clear winner in December after discussing the entire experience. This reminded me of Ouran so much.